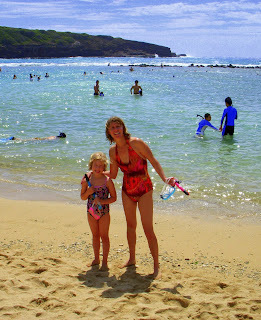 Keeps Me Smiling: Hanauma Bay (or any other crowded place) With Kids! Hanauma Bay (or any other crowded place) With Kids! Hanauma Bay on the island of Oahu is a snorkeler's paradise. Given that I have a thing for fish, it was a must-see on our recent trip to Waikiki. I took some notes from Carolina over at Kids Go West who has great advice on snorkeling with kids, and we were off and running. Or so we thought...OK, there is some Disneyland element to it all. But it's what we signed up for, and dag nabbit, we were going in! This is my daughter happy from swimming with fish like the ones we saw at the aquarium the day before. And there is me, happy that I saw her see fish (and realizing that a true grownup snorkel may not happen this decade). 4) Don't try and waste time going off the beaten track at a popular attraction. The track that is most beaten might be the best one for kids. Just embrace the atmosphere, rub some elbows, and go for it! 5) Bring something fun to do on the way home to distract kids who are on the verge, like a story, sticker book, or a few gummy bears (they work wonders!). Next stop - North Shore! And on the way, I'll stop by Photo Friday to scope out the scene. Yup. Definitely have to pack 'patience' when traveling with kids. Look like you guys had a great time there! Oh my goodness...I am laughing because this post brought back some funny memories of me in 8th grade standing on the reef afraid to get in the water at Hanauma Bay! Do they still sell frozen peas to feed the fish with? Spectacular colors in that water. It's been years since I've been snorkling! Thanks for sharing your experience. Oh, we went to Hanauma Bay two years ago....I understand :) I second all those tips. The funny thing was that my son was more interested in floating and swimming in the calm water than he was in snorkeling that day. And after my 2 week Hawaii trip,, I have also come to the conclusion that a proper, grown-up snorkeling trip may be a bit far off in my future. I don't remember if you said you use snapfish or not? Totally agree about not trying to go off the beaten track with kids! There's a reason the track is beaten in the first place :o) And kids want to do what they see other kids doing. Gorgeous photos! Like the off the beaten track tip...somewhat tru, but I've never thought about it before. I'm glad you enjoyed your snorkeling adventure. 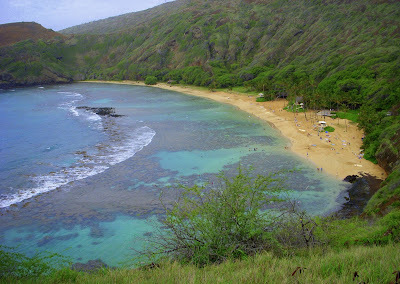 I was just at Hanauma Bay last week and here is my tip- go late. Like 4:30 or 5:00 late. We got in for free and there was hardly anyone there. It did get a little choppy towards the end but still, lack of crowds and free can't be beat. Honestly- my best advice is to head over to Sharks Cove on the North Shore. Way less crowded and great snorkeling. As long as it isn't the winter. We just returned from snorkeling at Hanauma Bay this morning. We got there a little after six am and there was only one other family on the beach with us - Nice! I saw a large turtle right away and even though my two daughters and wife were either too cold or scared to stay with me for long, I had a fantastic time! Saw every kind of dozens of species of fish, an octopus, and I think a barracuda - not sure but it sure looked like one. You'll hear it over and over - GO EARLY! We finished up at about 9am and by that time there was a long line and the parking lot was full. And one of the nice ladies who worked there showed my trick to keep you mask clear from fogging up. Take one of the broad leaves growing around the perimeter of the beach and rub it on the entire of the mask using a little ocean water. Keep doing it until the water turns a little green. Rinse once in the water and put it on. Worked great! Nice thing - we got there so early they weren't charging! The guy said he didn't have the staff to start collecting at 6am - Nice!